This month’s T-SQL Tuesday topic is SQL Family and is brought to us by Jeffrey Verheul (b/t). It’s an amazing topic, but a difficult one for me to put into words. 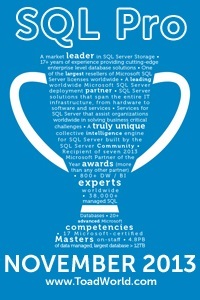 SQL Family is a lot of things, but at its base it is a group of people with a similar interest coming together. What makes them(us) unusual is that they(we) are almost rabidly inclusive. I should probably take a step back here and mention that I’m not good at making friends. I’m not comfortable in social situations. I’m almost terminally shy. This is in spite of any evidence to the contrary for those of you who’ve actually met me. My first experience with the SQL Family was going to the Pass Summit in 2011. Everyone was incredibly friendly and walking up to someone and starting a conversation was not only expected but encouraged. I spent every opportunity talking to people who not only understood what I was talking about but had the same passion for it that I did. Of course over a three+ day period not every conversation could be SQL related. Of note was one very interesting extended conversation with a SQL Server MVP about raising chickens. He even ended up signing my copy of SQL Server MVP Deep Dives 2. This experience (the summit not the chickens) directly led to starting my blog and eventually joining twitter. If you haven’t had a chance to try it yet (although if you are reading this blog you probably have) you will find that the SQL Family will be more than willing to not only talk endlessly about SQL Server but pretty much anything else in their lives also. On that note I also want to congratulate Vicky Harp(b/t) and Redi311 (b/t) who both added new members to their families (and ours) in the last week.